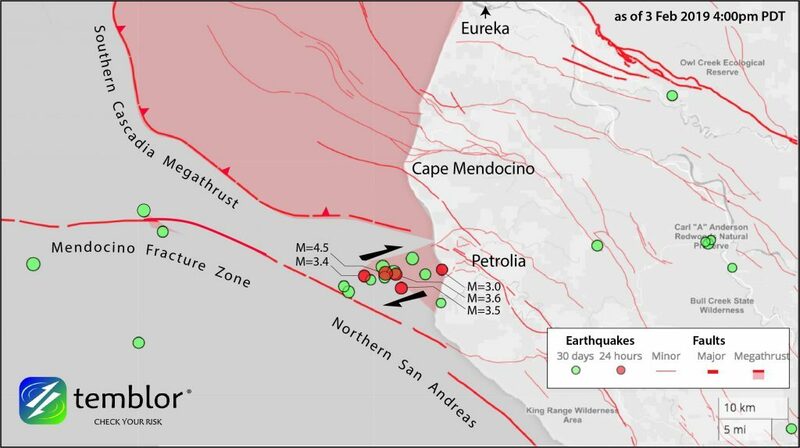 A seismic swarm is in progress between southern Cascadia and northern San Andreas Faults since yesterday afternoon, with four shallow quakes – M4.5, M3.4, M4.1, M3.7 – in two hours west of Petrolia, California. 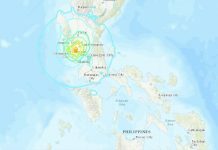 A fifth M2.8 very shallow earthquake struck the same area a few hours later. 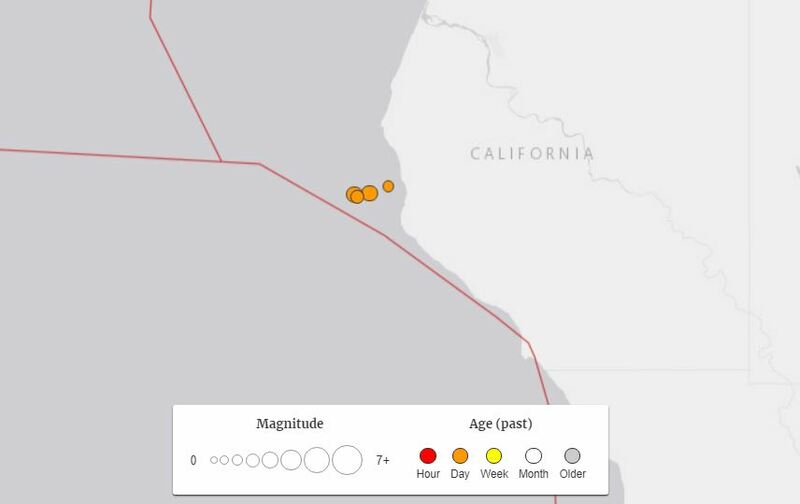 According to Tremblor’s map, the 5 earthquakes occurred on a right-lateral reverse fault that connects the San Andreas-Mendocino Fracture Zone with the shallow portion of the Cascadia Subduction Zone. It is in this region that the two fastest-slipping faults in the western U.S. join, or nearly join. It is also where both the San Andreas and Cascadia Faults bend, meaning that the crust is being crushed, distorted, and fractured here. 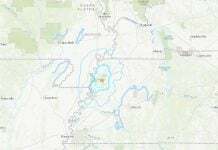 USGS map of the earthquakes that hit off Petrolia on the Cascadia and San Andreas fault lines. 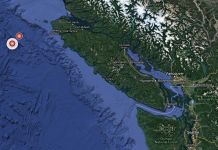 What this event means for the Cascadia and San Andreas Faults is unknown. We however know that both faults are overdue for a cataclysmic earthquake. Cascadia by more than 30 years and San Andreas by more than 40 years. Managing earthquake risk requires a resilient system of social awareness, education and communications, coupled with effective short- and long-term responses and implemented within an optimally safe built environment. As California prepares for large earthquakes after a hiatus of more than a century, the clock is ticking. Yes, get ready and be prepared the the next Big Ones! Hey, quite a story on the San Andreas and Cascadia faults. Makes me wonder when California is going to go sliding into the ocean. Do you have any references or sources to back this information? I did some research and cannot find anything to collaborate your story. I always put the source at the end of the article. If you follow the links you will also find some information at the end of the articles or within the articles. A strange plane crash into residential area in Yorba Linda, California killing 5 people. This is obviously Karmic Effect on Low Vibration people (or human disguising Reptilians) with Heavy Karma. High Vibration (or high frequency) loving people are protected and safe in anywhere in anytime even in the plane crash site. A massive sinkhole swallowed up an excavator and its operator along Yerba Buena Road in Ventura County amid heavy rains over the weekend. Most of the dark agents from Dark Entities such as Illuminati, Reptilian Agencies have some how Cave men = Neanderthals looking with all the thick facial hair. Almost all the militants in KKK (Nazi in Alabama) who are stalking me and shooting me have Neanderthals looking with all the thick facial hair. I tell you that the Neanderthals Had Not Gone Extinct at all! They are all around me. Of course, Neanderthals means cannibals. They have Reptilian gene. Many of them might be Jews who have shape-shifting abilities from Reptilian to Human or Human to Reptilian. Simply Neanderthals might be Reptilians who needs human blood so that they can keep the human figure. According to the weather forecast, we are going to have high temperature 75 and the low temperature 64 tomorrow here in Tuscumbia Alabama. This is crazy temperature fluctuation after the coldest temperature we had recently. Is this a kind of effect from the rotational change of the Earth (wobbling up and down) because of the Polar Shift and Axis Shift? Recent years, we have so many rainy days. It looks like here is going to be a rain forest. It looks already a rain forest with so much moss on trees. Many trees fell down or split in half and died because of climate change. How Does An Entire Island Go Missing? | What on Earth? Is this the missing “Sandy Island” on Google Map? It looks like under the water right now. Lassen Volcano got M1.4 quake with depth 2miles on February 3. Mt Rainier got an quake for 3 consecutive days, M0.3 with depth of 1.6km on January 31, M0.6 with depth of 1.3km on February 1 and M0.8 with depth of 1.7km on february 2. 110 deaths and 238 missing. M1.4 tremor in the heart of the downtown Seattle with depth of 24.3 km. This should be the result of the Reptilian Secret Underground Base cleaning up operation by Galactic Federation of Light. I went several time around there because there was Japanese consulate there. The epicenter was the heart of the downtown Seattle.